The National Museum incorporates the collections of the former National Museum of Antiquities of Scotland, and the Royal Museum. As well as the main national collections of Scottish archaeological finds and medieval objects, the museum contains artifacts from around the world, encompassing geology, archaeology, natural history, science, technology and art. The 16 new galleries reopened in 2011 include 8,000 objects, 80 per cent of which were not formerly on display. One of the more notable exhibits is the stuffed body of Dolly the sheep, the first successful clone of a mammal from an adult cell. Other highlights include Ancient Egyptian exhibitions, one of Elton John's extravagant suits and a large kinetic sculpture named the Millennium Clock. A Scottish invention that is a perennial favorite with school parties is The Maiden, an early form of guillotine. Operating hours are: Daily 10:00 am to 5:00 pm (17:00). Closed Christmas Day. Limited hours for Boxing Day: 12:00 pm to 5:00 pm (17:00) and New Year's Day 12:00 pm to 5:30 pm (17:30). Pay and display parking is available on Chambers Street and off-street parking nearby at NCP Quartermile. Further information on parking can be found at www.edinburgh.gov.uk/parking. This machine is within easy walking distance (round trip 1 mile) to the Edinburgh Castle, Camera Obscura, Edinburgh Old Town Weaving, Edinburgh Dungeons, The Real Mary King's Close, The Museum on the Mound (Bank of Scotland) and The National Galleries of Scotland penny machines. The penny machine is on the first floor inside the Connect Shop gift shop. 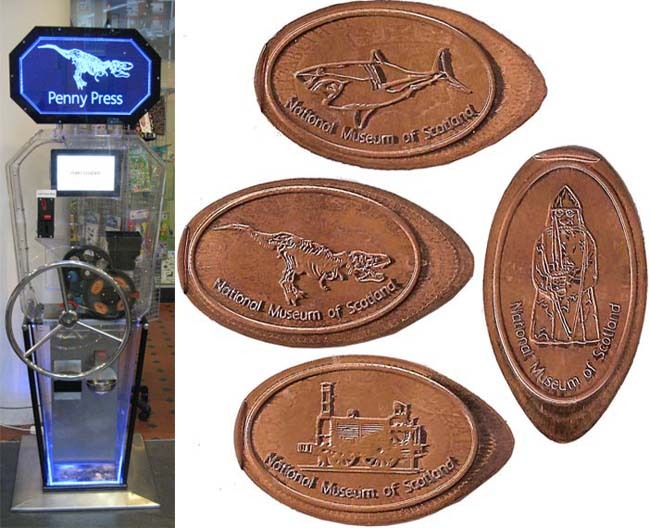 There are four designs available from a Penny Press Factory "GEM" wheel cranked machine. Each cost £1.00 on a coin that is supplied by the machine. 2. (H) Skeleton of a Tyrannosaurus Rex. 3. (H) James Watt steam engine. 4. (V) A "Berserker" chess man from the Isle of Lewis. G.P.S. coordinates: Latitude: 55° 56' 48.7314" Longitude: -3° 11' 26.214"